2018 showed cryptocurrency investors that there are many risks to mitigate, including security, so what should they do better in 2019? Let’s talk hardware wallets, what they are, why you should use one, and other security best practices for the New Year. Security is often one of the top concerns in the crypto community, and especially at Team Decentranet. We want to know what different blockchain projects are doing to combat attacks on the network, we want to see extra security precautions taken by exchanges with things like 2-factor authentication (2FA), and the list goes on. However, sometimes we get so caught up in what other people or companies are doing to enhance security that we neglect what we are doing to ensure our crypto assets are secure. As the cryptocurrency industry is still nascent, it’s not surprising that we’ve had so many encounters with sub-par security in the past resulting in hacks and theft. Of the most recent attacks, hackers reportedly stole nearly $60 million worth of cryptocurrencies (6.7 billion yen) from the Japanese exchange Zaif, and that’s only the most recent. At the beginning of 2018, another Japanese exchange, Coincheck, made history as the victim of the largest cryptocurrency exchange theft to date, losing an estimated $400 million worth of cryptocurrencies. In fact, 2018 was a record-breaking year for exchange hacks and funds lost. So if we know 2018 exposed investors to so much risk, what does that mean we should do in 2019 to reduce our own risk? Let’s talk hardware wallets, what they are, why you should be using one, and other security best practices for the new year. There’s an old saying in the crypto community that if you don’t own your keys, you don’t own your cryptocurrencies. In essence, that single statement summarizes the issues with cryptocurrency exchanges. Exchanges are centralized platforms that are designed to facilitate transactions; they’re not banks. While large exchanges like Binance, Coinbase and others have come a long way in terms of their security measures, you’re effectively outsourcing security to a third party rather than ensuring your funds are secure on your own. That’s where hardware wallets come in. A hardware wallet is a physical device that’s used for storing your private key securely away from anyone who’s not the primary user. These physical devices store your private key(s) in an encrypted offline environment, meaning your wallet won’t be vulnerable to the types of attacks carried out against exchanges and even individual investors using software wallets (a wallet on your computer or phone connected to the internet, also known as a “hot wallet”). The answer is pretty clear here: security. Storing cryptocurrencies — especially for long term investments — with a hardware wallet ensures that you actually own the asset, and have additional protection. You can think of keeping your crypto on an exchange as effectively having an “IOU,” not the crypto itself. If something happens to the exchange, your crypto is gone, whether that be due to a hack, scam, or unforeseen problem with the team managing the exchange. Investors have a variety of options for offline storage, including an air-gapped computer or paper wallet, but those have their own limitations. Fortunately, with the advancement of the cryptocurrency industry came many companies specializing in creating dedicated hardware for storing cryptocurrencies securely. There’s a good chance you may have already heard some of the bigger names like Trezor, Ledger Nano S, and KeepKey. All three are great wallet options and are designed to be user-friendly. Additionally, all three of the big names (along with other manufacturers) support multiple cryptocurrencies so you’ll be able to store your bitcoin, ether, and numerous tokens all in one place. Of course, a hardware wallet is nothing more than a tool (albeit an effective one). With that in mind, it’s important to remember that ultimately it will only be as secure as you are. So here are some security best practices to use with your wallet. Always purchase a hardware wallet directly from the manufacturer: Avoid discounted used ones from Craigslist, eBay, and especially a free wallet being handed out at an event. Always backup your wallet seed and recovery phrase: This is the mnemonic passphrase you’ll need to recover your wallet should it ever be lost or stolen. 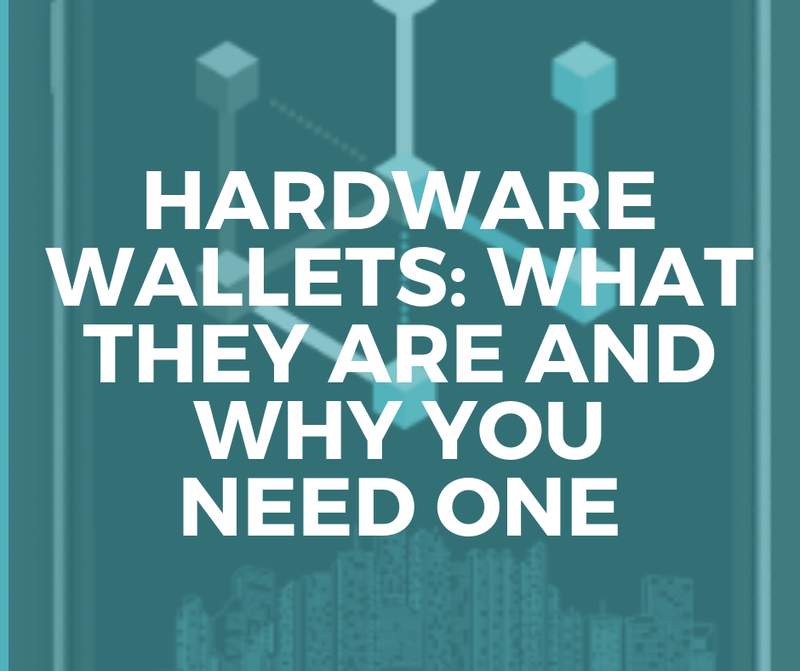 Now that we’ve talked hardware wallets and why they matter, you should have a better idea about why you ought to be using one. Hardware wallets are far more secure than storing crypto on your phone or personal computer and are leaps and bounds ahead of storing funds on an exchange. But remember, they’re not the ultimate be-all-end-all for crypto security — you are. Click HERE for instant access to our 2019 Market Report. Explore what 30 thought-leaders from dozens of industry verticals had to say. We are advisors and consultants that work with blockchain companies and other transformational technology projects. If you’d like to connect with us on how we can help your company, please click HERE or send us an email at hello@decentranet.com. You can also reach out to inquire about any of our current clients or portfolio companies at hello@decentranet.com. © 2018 DecentraNet LLC | Disclaimer: Articles published are for informational purposes only. Any information or opinions expressed should not be taken as investment advice. Please conduct your own research or consult with your legal or tax advisor before investing in any cryptocurrency or other investment vehicles.